Below is County Map of Contra Costa in California showing the boundaries, roads, highways, towns and much more. 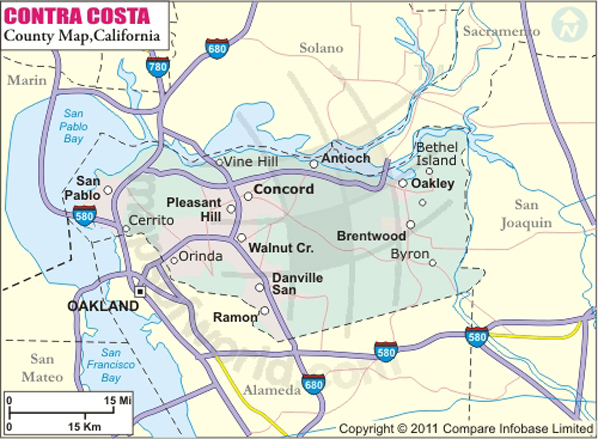 Contra Costa County is located in the northern portion of the East Bay region in Northern California. Its name means "opposite the coast" in Spanish. Largely suburban in character, the county lies in the San Francisco–Oakland–Hayward, CA Metropolitan Statistical Area. The county seat is Martinez and the most populous city is Concord, which is primarily a bedroom community. The county covers an area of 804 square miles. The upthrust peak of 1,173-meter Mount Diablo, the most visible natural landmark in the East Bay Area. The mountain is the centerpiece of Mt. Diablo State Park. Camping facilities and multi-purpose trails are available for visitors in the park. Antioch Dunes National Wildlife Refuge, Don Francisco Galindo House, Don Francisco Galindo House, and San Pablo Reservoir are prominent points of interest in Contra Costa County. Downtown Martinez is lined with historical buildings and antique shops. Amtrak daily runs California Zephyr and Coast Starlight trains through Martinez, while cities of Richmond, Martinez, and Antioch lie along Amtrak's San Joaquins route. The city of Concord is served by Interstate 680 and California State Route 4 – a major east-west corridor in Contra Costa County. Nearest commercial airports are in Oakland and San Francisco. Bay Area Rapid Transit (BART) provides local transportation in the region.